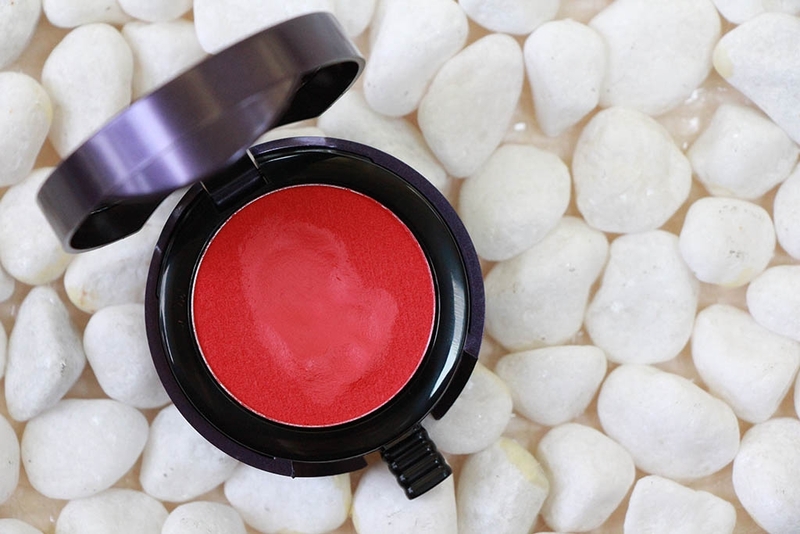 Let’s start with more about what this weird little disc of lip color actually is. 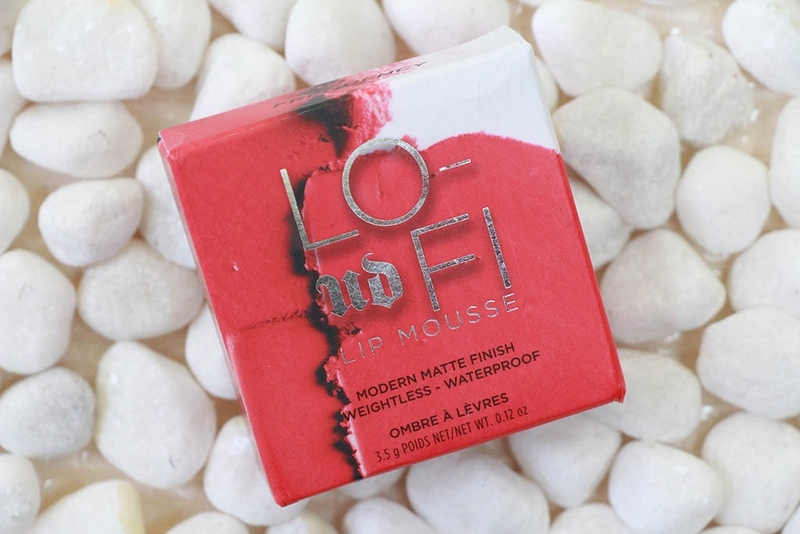 The Lo-Fi Lip Mousse is meant to be an incredibly pigmented, buildable, weightless, waterproof, matte mousse lip stain. That’s a lot in one! 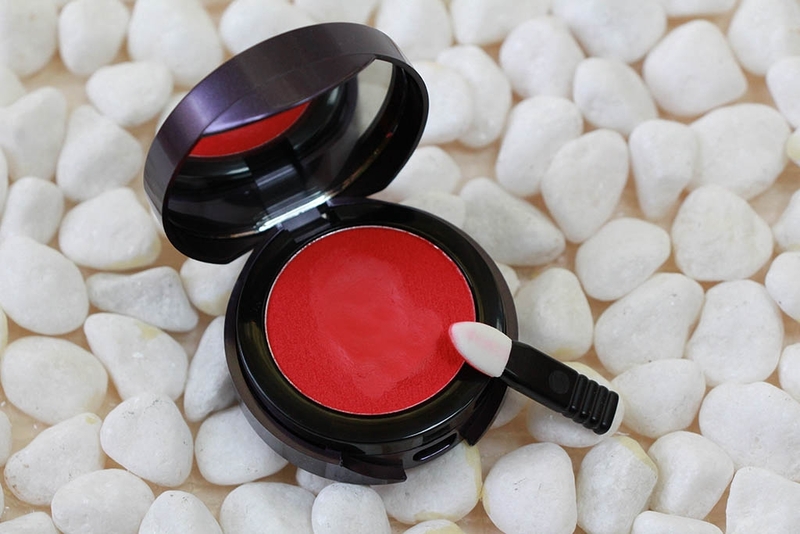 The product is housed in a round little compact complete with mirror – it kind of looks like a blush to me – and it comes with a foam applicator that pops out only after you open the lid. It’s a really ingenious design. They thought of everything and crammed it all into a small little compact. If you’re looking for something you can throw in your bag and go, then this is perfect for that! There’s no wasted space, so great job on the packaging. The consistency isn’t quite what I would call a mousse, but more of a soft, slightly creamy powder. 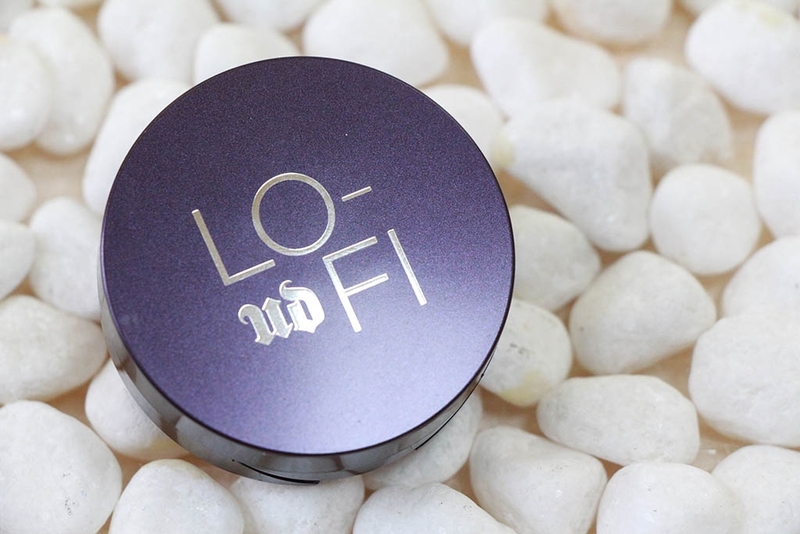 It’s actually a bit like a ColourPop shadow that has mostly dried out and without that “bounciness.” Maybe that’s too complicated for a description – a dry, but creamy powder works too. 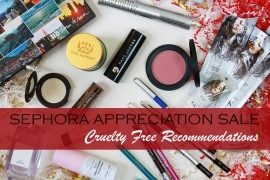 The product is meant to be applied either with the included applicator or just with your finger – the look is slightly more intense with the applicator and a bit softer and more blotted when applied with your finger. As I mentioned, I would rather apply with my finger as I prefer a less polished, less pigmented look. That said, I do find it quite difficult to keep the product within my lip lines, and it is pigmented enough that it can look pretty messy – and not in a “cool” way. I usually end up looking more like I just can’t apply lip color, or I’ve smeared it all over my face after a huge meal. Add to that when applying with your fingers on the go, you’re going to be left with a bunch of rather intense pigment on your fingers with few options to remove it. The best method for application that I’ve found is to use the applicator to get the outer edges of the lip cleanly applied and then build the color further with your finger if so desired. Not sure I’m loving the application process, but kind of a cool consistency. So you’ve applied the Lip Mousse. What does it feel like? How does it wear? How does it look? We’re getting there! 😄 I have only tried one shade, “Frequency,” so I cannot speak to all shades being similar, but I suspect they are. I find that no matter how I apply this product, it makes my lips feel dry…similar to a liquid lipstick. Like liquid lipsticks, when the Lip Mousse is applied to the lips and left untopped by balms or glosses, it’s also transfer-resistant! It is weightless, which is nice too, but my lips quickly feel so dry! I have tried applying it alone, as well as over lip balm. Either way, it still makes my lips feel more dry than I’m comfortable with. The problem with lip balm under the mousse is that you end up wiping all that balm away while applying the Lo-Fi Lip Mousse and it still feels dry. The untopped finish is indeed matte, and it does have a soft staining effect – the color remains for a while and slowly fades if you don’t reapply. The color itself applies evenly, though as I mentioned, I find it hard to keep it from looking too messy around the edges when applying with my fingers. I have tried topping the Lip Mousse with a lip balm to make it more comfortable, and that definitely helps, but it not surprisingly lessens the wear time, makes it more prone to straying from where it’s been applied, it transfers, and the balm / gloss defeats the matte effect. As the balm wears away, the stain does stay put for a while and will eventually become transfer resistant while retaining some color though. This is my favorite way to wear the Lo-Fi Lip Mousse, but still that initial dryness is kind of a deal-breaker for me. That doesn’t mean it’s a bad product, just not a product that I think everyone would enjoy. I will say for a lip stain-like product, this is actually pretty good. It does stain somewhat. 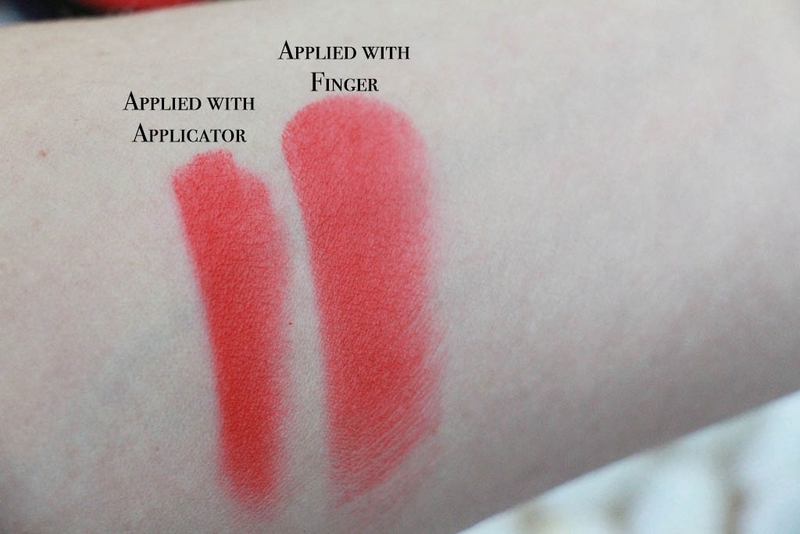 It applies even pigment to the lips, and I love that you can control the intensity of pigment. It also takes a good while to fade and it’s removes easily with makeup remover. Yes, it’s drying, but I can’t think of a lip stain I’ve tried that isn’t. Sadly, the dryness is the biggest deal breaker for me, though the mess made both around my lips and on my fingers from application is also not great. I don’t want to run around with slightly orange fingers all day! I’m also not a huge fan of dipping my finger into a pot on the go because of all the nasty germs that are surely coating one’s hands in such situations, but then there is the applicator conveniently tucked into the compact if you’re in a pinch…though the germs that could grow on that freak me out a bit too. 😄 All in all, I feel like the concept for the Lo-Fi Lip Mousse is great, but the product itself could still use some improvement. That said, if a bit of dryness doesn’t bother you and you’re after a lip stain, this is definitely a good attempt. And if you want to top it with a gloss, the dryness would be alleviated…but the wear time and the matte finish will also suffer. 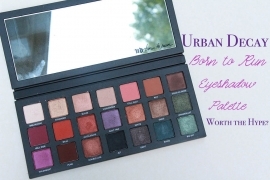 It’s definitely not a sure-fire hit from Urban Decay, but I do feel like some people might appreciate it. Sadly, I’m not one of them.